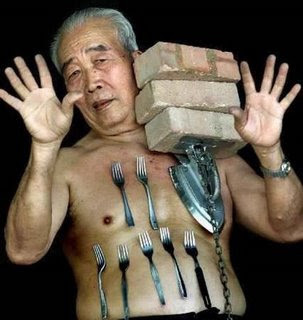 Liew Thow Lin of Malaysia is known as the "Magnet Man", or "Mr. Magnet" because he has the ability to stick metal objects to his body. Lin has performed in many charity events showing his ability. He can make metal objects, weighing up to 2kg each, up to 36 kg total, stick to his skin. He has also pulled a car using this ability. Lin's ability is not due to any source of magnetism. Scientists from Malaysia's University of Technology found no magnetic field in Lin's body, but did determine that his skin exhibits very high levels of friction, providing a "suction effect". The trait appears to be genetic, appearing in Lin's three sons and two grandchildren. Lin was featured on the second episode of the Discovery Channel's One Step Beyond. Really amazing, shocking , touching story of this world's lucky man. So guys! do read this to find out the hidden meaning of the story.